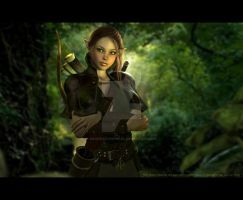 An image of the Morrigan that I did for a contest on Renderosity. I'm really pleased with the way she turned out, especially the lighting. Trying to get the effect of a lightning strike is fairly easy, but picking where I wanted the "strike" to cast light from... *shakes her head* Well and all, it looks good. The Morrigan is the Celtic goddess of war and fertility. She's often associated with crows, so I attempted to incorporate a certain bird-like imagery into the picture. Not sure how that turned out, or if I did too much black. V3 rr, V3 tunic pack, celtic broadsword from DAZ, helmet from Runtime DNA, pose by Dragongurl. Postwork in PSP7, rendering in DAZ|Studio. You can never have too much black dear. ... OK, you can, but it's REALLY hard. Nice piece, it certainly holds it's own and tells a story. My two concerns with this piece though, are the sword and the clouds. The clouds look like a TV scan used as a background layer because of the flecks of colour in all the dark places. If that was the intention, then oops. If not, maybe desaturating the layer might have helped. The sword looks as though it's not actually being held. It looks like it's behind the hand. I agree with mistressofspam, you've got a winner here. I hadn't yet looked at the title when I first saw it, and thought 'That's Morrigan' before I even read your blurb. You captured her essence quite well. I love the lighting and the lightning... and you pulled the crow motif well. I'm a little bothered by the place the cloak connects to her shoulder, it looks a little out of place, which could just be perspective illusions. While I don't work with 3D tools, I have tried them, and highly respect anyone that can make them work. That being said, I can usually spot a piece made with them. I don't know if it has to do with the too-smooth skin tones or the musculature, but it is apparent (at least to me). I know it is possible to get rid of that look, as I've seen it -- but very seldom! If you want to 'step up' to the next level (cuz you've obviously figured this level out quite well!) then that would be a good goal to try for. Greetings. I got your link off of the yahoo art show group *grin* I have to say, this is by far my favorite of all of your pieces. There's something simply *wonderful* about your composition here, and I adore the lighting effects you've got going on. Just a lovely job all around.